Cramer & Anderson Partner Joshua Weinshank, who just opened a new office in Ridgefield for western Connecticut’s largest regional law firm, has been named to the Finance Committee of the Ridgefield Visiting Nurse Association (RVNA). 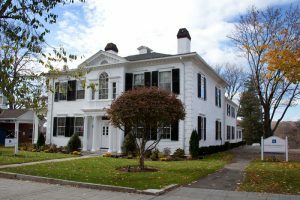 “It’s a really important commitment, as the Finance Committee monitors the agency’s operational and endowment financial performance, and develops and evaluates performance metrics and financial forecasts,” Theresa Santoro, RVNA’s CEO and President, said of Attorney Weinshank joining a 12-member committee that meets monthly. “In addition, the committee oversees the 403b retirement plan as well as the agency’s 501c3 status,” Ms. Santoro said. RVNA seeks Finance Committee members who have a financial and legal background, as well as experience with tax auditing and financial planning. Ms. Santoro called Attorney Weinshank, whose practice is focused on Estate Planning and Trusts, along with Elder Law, a perfect fit for the Finance Committee—especially at a time when RVNA is growing and expanding with the creation of a Hospice program. Founded in 1914, RVNA is a non-profit, fully accredited Medicare-certified home health care agency that also supports public health and safety, and promotes the highest quality of life. RVNA has a staff of nearly 300 employees working across a number of business lines, including rehabilitation, home care, and a physical therapy center. Last year alone, more than 46,000 home visits were logged, serving 1,500 patients. RVNA provides compassionate care to all individuals, whether young or old, through a continuum of care that encompasses health care at home and in the community. RVNA also provides home health aides and companionship through a non-medical subsidiary called HomeCare by RVNA and outpatient physical, occupational and speech therapy in its Rehab by RVNA facility at 27 Governor Street in Ridgefield. In another new Ridgefield role, Attorney Weinshank has been appointed to the Board of The Ridgefield Playhouse. Attorney Weinshank may be reached by email at jweinshank@crameranderson.com and by phone at the Ridgefield office at (203) 403-4005. The address of the new office is 38C Grove Street.